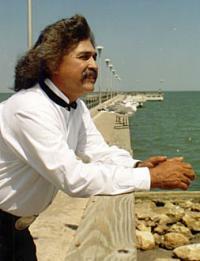 Freddy Fender, the »Bebop Kid« of the Texas-Mexico border who later turned his twangy tenor into the smash country ballad »Before the Next Teardrop Falls,« died Saturday. He was 69. Fender hit it big in 1975 after some regional success, years of struggling — and a stint in prison — when »Before the Next Teardrop Falls« climbed to No. 1 on the pop and country charts. »Wasted Days and Wasted Nights« rose to No. 1 on the country chart and top 10 on the pop chart that same year, while »Secret Love« and »You'll Lose a Good Thing« also hit No. 1 in the country charts. Born Baldemar Huerta, Fender was proud of his Mexican-American heritage and frequently sung verses or whole songs in Spanish. »Teardrop« had a verse in Spanish. Among his other achievements, Fender appeared in the 1987 motion picture »The Milagro Beanfield War,« directed by Robert Redford. »Hopefully I'll be the first Mexican-American going into Hillbilly Heaven,« he said. But his career really began in the late '50s, when he returned from serving in the Marines and recorded Spanish-language versions of Elvis Presley's »Don't Be Cruel« and Harry Belafonte's »Jamaica Farewell.« The recordings were hits in Mexico and South America. He signed with Imperial Records in 1959, renaming himself »Fender« after the brand of his electric guitar, »Freddy« because it sounded good with Fender. Fender initially recorded »Wasted Days« in 1960. But his career was put on hold shortly after that when he and his bass player ended up spending almost three years in prison in Angola, La., for marijuana possession. But his second break came when he was persuaded to record »Before the Next Teardrop Falls« on an independent label in 1974 and it was picked up by a major label. With its success, he won the Academy of Country Music's best new artist award in 1975. He re-released »Wasted Days and Wasted Nights« and it climbed to the top of the charts as well.